Three ways to sell your diamonds to us! Selling to us is simple and easy. 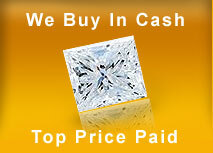 Just call us on 1-800-242-7766 and tell us what you have and we will send you insured, pre paid shipping label. If you have large quantity or high value we will arrange pick up by armoured courrier also in special case member of buying team can visit your location. On receipt of merchandise we will create inventory log in presense of two responsible team member and our buyer will appraise your merchandise and a senior member will give you exact value you will be getting for your lots. If you agree then we can send funds to you in any prefer method of payment like check, direct deposit or wire transfer to your bank account. For some reason if you do not want to sell we will send back your merchandise at no charge to you. Simple and honest business is our four generation practice.